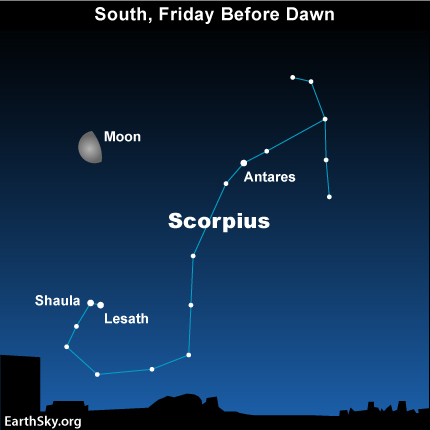 On the morning of Friday, March 25, 2011, the waning gibbous moon helps you to locate the two “tail-end” stars of the constellation Scorpius the Scorpion. These two very noticeable stars – called Shaula and Lesath – are often shown on old star maps at the tip of the Scorpion’s stinger. 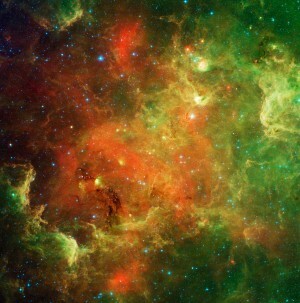 The Scorpion is a very noticeable constellation, one of the few that looks like its namesake. To northern hemisphere viewers, this pattern of stars appears to have a curved tail sweeping down toward the southern horizon. Antares (the Scorpion’s reddish heart) is the brightest star in Scorpius, but Shaula and Lesath are very noticeable, too, for being at the end of the curved tail pattern and for appearing so close together. You will spot them easily if you look outside – under the moon – Wednesday morning. Stories about Shaula and Lesath vary greatly. In some Polynesian legends these two stars were called Pipiri and Rehua, a brother-sister pair who, angry at their parents for some imagined unfairness, ran away to the sky where they are now stuck as stars. In reality, Shaula and Lesath are indeed slightly related to each other (and to many others) in that they are young as stars go and are of similar star type (B). They also may have been formed from the same interstellar cloud. They are not that close together, however – Shaula is 700 light years away, and Lesach about 520. Site contents copyright © 2019 Recorder Online	except as noted. All rights reserved. | 88 queries in 2.481 seconds.